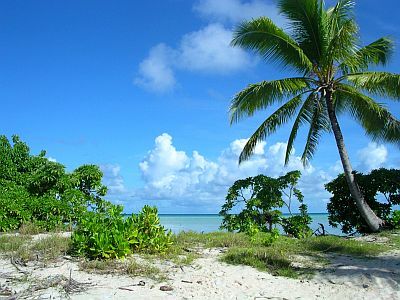 The climate of Kiribati is tropical, hot all year round, with considerable differences in rainfall. In fact, the islands are scattered in the middle of the Pacific Ocean around the Equator, and span a vast area; in addition, in the central and eastern part of the country, a strange phenomenon occurs: the islands located along the Equator receive a cool sea current from the east, which even arrives from South America, and is able to make the climate more arid. In the west, the Gilbert Islands, from which the name of the entire archipelago is derived, have an equatorial climate, rainy throughout the year, with a rainier season from December to April and a relatively less rainy season from May to November. Banaba Island (or Ocean Island), located apart from the others in the south-west, has a similar climate. In the capital, South Tarawa, the daytime temperature is very stable, around 31 °C (88 °F) throughout the year. Here are the average temperatures. In South Tarawa, 1,900 millimeters (75 inches) of rain fall per year, with a maximum in January of 270 mm (10.5 in) and a minimum in September and October of 90 mm (3.5 in) each month. Towards the south, the rainfall decreases gradually, until it reaches about 1,500 mm (60 in) on the southernmost islands of the group. Here is the average precipitation in South Tarawa. The sea is warm all year round as well, as you can see in the following table. 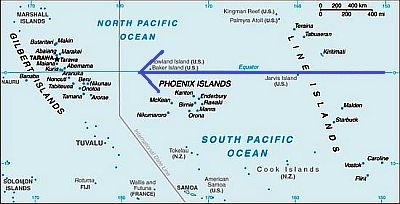 In the central area, the Phoenix Islands, almost completely uninhabited, are more arid; in fact, in the only inhabited atoll, Canton, just 500 mm (20 in) of rain fall per year, with little rainfall from October to February and moderate rainfall in the rest of the year. In the east, the Line Islands, or Equatorial Sporades, almost in the middle of the Pacific Ocean, are very extended in latitude. On these islands, the amount of rainfall varies depending on the area: the central islands, despite being near the Equator, are semi-arid, while the northern islands are rainy because they lie within the Intertropical Convergence Zone. So, precipitation amounts to only 450 mm (17.5 in) per year on Malden Island, just south of the Equator, where it exceeds 100 mm (4 in) per month only in April and May; it reaches 1,000 mm (40 in) on Christmas Island (or Kiritimati), just north of the Equator, with rains of some importance falling practically only in March and April. The rains are much more abundant to the north, on Fanning Island (or Tabuaeran), which has a lush vegetation, and receives 2,100 mm (83 in) of rain per year. Here, however, rainfall drops below 100 mm (4 in) between September and November, but it's also acceptable in August, with 115 mm (4.5 in) of rain. More to the northwest, Washington Island (or Teraina) is even rainier. Continuing northwest along the line where these islands are located, we find two US-owned atolls, Palmyra and Kingman Reef, which still have an equatorial climate, hot and rainy all year round. On the southern islands (Vostok, Caroline, and Flint), the rains are at an intermediate level, in fact, they receive slightly more than 1,000 mm (40 in) of rain per year. Here is the average precipitation on Christmas Island. On these islands, too, the temperature is high all year round, as we can see from the averages of Christmas Island. On these eastern islands, the sea is warm all year round, even though it's just cooler than in the western ones, in fact, the water temperature is around 27/28 °C (81/82 °F). So far, we have talked about the average temperature and rainfall, but it must be said that the Kiribati Islands are strongly influenced by the phenomenon known as El Niño, as well as its opposite, La Niña. With El Niño, the eastern current that carries relatively cold water from South America slows down, so the climate becomes warmer and rainier than normal, while with La Niña, the eastern current becomes even more intense, so the climate becomes cooler and drier, leading to recurrent drought, which in these atolls, flat and devoid of streams, can cause major problems. Being practically at the Equator, the Kiribatis are outside of the area where cyclones form. However, being flat islands, they can sometimes receive anomalous waves, especially if they are combined with high tide, as happened in Tarawa, both with Cyclone Pam in March 2015 and with Cyclone Tia in November 1991 (both were cyclones of the southern hemisphere). In theory, the southern Line Islands (Vostok, Caroline, and Flint) are located at the edge of the area where they can form, in the period from November to April, although cyclones are rare in this area. The best time to visit the Western Kiribati Islands (i.e. the Gilbert Islands) runs from May to November, and even more from September to November, which is the least rainy period of the year. Being that they are drier, you can visit the Phoenix Islands as well as the central Line Islands all year round, while in the southern Line Islands, you can avoid for safety the period from November to April because of the risk of cyclones. All year round, bring tropics-friendly, loose-fitting clothing, a sun hat, a scarf for the breeze, and a light sweatshirt for the evening. You can add a light raincoat or umbrella, especially on the Gilbert Islands.